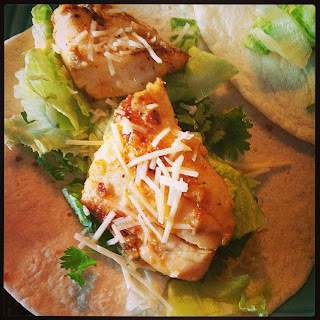 Fish tacos for dinner tonight.... Quick, refreshing on a hot night, and very tasty. Cut fish filets in fourths, saute in frying pan for 3-5 min until cooked through, with the butter/olive oil, and seasonings. Warm tortillias, layer ingredients in each tortillia. You can also use frozen fish filets, batter dipped or crunchy. I like the tacos both ways. Tonight we made both, but didn't take a picture of that taco option. Serve with my Grandma's Spanish rice recipe, and you have a great meal.